Nielson is actively seeking a Virtual Recruiter in the US. The job involves screening resumes, research, arranging interviews, and submitting quality candidates to hiring managers. Go here to apply. Gabbyville is hiring Virtual Receptionists to work from home in the US. No state restrictions. The pay is reported to be $9-$12 per hour. Submit your resume and cover letter to [email protected]. 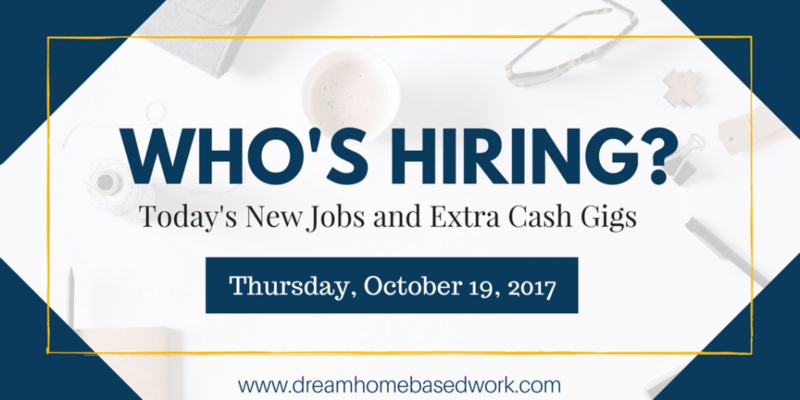 GoTranscript is hiring Remote Transcribers to work from home. This position is open worldwide. Go here to apply. More transcription jobs for beginners and pros listed here. Lionbridge is currently seeking part-time work from home Map Quality Analysts in the US. All workers are required to work a minimum of 20 hours per week. Go here to apply. More part-time jobs are listed here. WebPageX is seeking freelance Copywriters and Editors to work from home. The job may involve writing blog articles, information guides, and more. Go here to apply. Freelance Script Writer – Apply now! Freelance Video Editor – Apply now! Freelance Voice Over Artists – Apply now! This company has openings for Court Researchers in the US. You can make $12 per hour as a courthouse researcher. You must visit your local courthouse frequently to retrieve info. Go here to apply. This company is currently seeking Freelance Translators from all over the world. The need translators in the following fields: Law Legal, Healthcare, Foreign Marketing, Entertainment & Media, and more. This company currently needs Survey Takers. The minimum cash out for users of this site is $3 which is equivalent to 300 points. Membership is open to people from the United States, Canada, United Kingdom and other European countries. It is completely free to sign up and start making money. UserTest accepts testers in the following countries: Africa Asia Pacific, The Americas, and Europe. This job involves recording your thoughts while browsing the internet. The pay is $10 per test.